In Philippine liner shipping, obviously the first time of trouble was when the Pacific War erupted after Japan attacked the Philippines and the United States. Liners were requisitioned by the US on the promise that it will be replaced when the war ends. The order then was if the ship cannot reach Australia it has to be scuttled to prevent it from falling into the invader’s hands. Most of our liner fleet then was lost to scuttling and to enemy fire. Some of it were captured and were pressed into enemy service and when Japan was already losing they sank into the bottom of the sea due to US submarine and aircraft attacks. These liners that were lost during the Pacific War were good liners and many were built in foreign shipyards just in the Commonwealth Era which means they were still new. The older ones were mainly built in the 1920’s. And they were not necessarily small. Many of the good liners before the war were in the 80-meter class (when internationally a 120-meter was already grand). When the US replaced our lost fleet as promised the number might have been right but the quality is different. The former “FS” ships were not the equal of our former liners even in size and to be able to use those they have to be converted and refitted first as they were not really liners but basic cargo ships. “FS” meant “Freight and Supply” after all. Former “Y” ships were also given as replacement and these were former tankers but still a handful were converted to passenger use by removing the tanks. The former “Y” ships were slightly smaller than the former “FS” ships. For the lost regional ships, the US gave as replacement the former “F” ships, both the steel-hulled and the wooden-hulled types. Former minesweepers were also given as replacement. None of them were passenger ships to begin with and so conversion and refitting still had to be done. To replace the bigger liners, the US gave Type C1-M-AV1 , Type C1-B and Type N3 ships as replacements but those were also cargo ships and not liners and so they also have to be converted and refitted. None of all these types can match the luxury and comfort of our prewar liners. Were we shortchanged in the deal? I think the answer is obvious. We had purpose-built liners before the war and the replacement were surplus cargo ships that had no use for them anymore because the war has already ended. 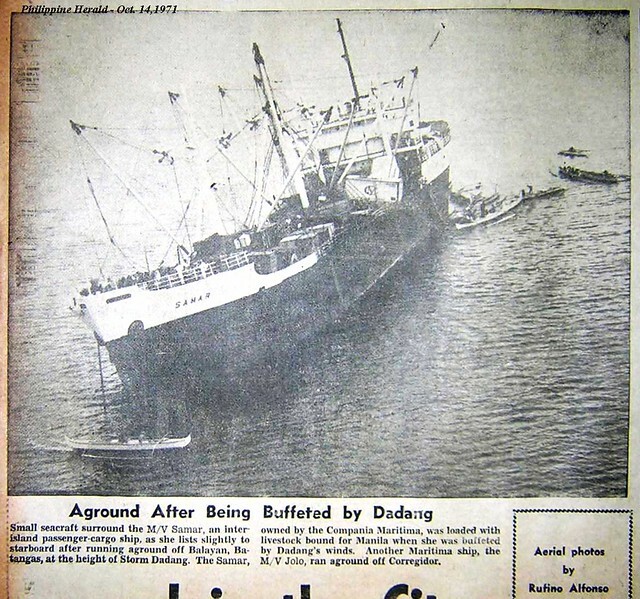 The second times of trouble for Philippine shipping was the crisis decade of the 1970’s when continuous devaluation of the peso dominated the economic situation. It was the time that taking out big loans was fraught with danger since nobody can foresee when will be the next devaluation (which means in peso value the loan balloons). Because of this uncertainty and risk, the taking out of loans to order brand-new ships completely stopped. 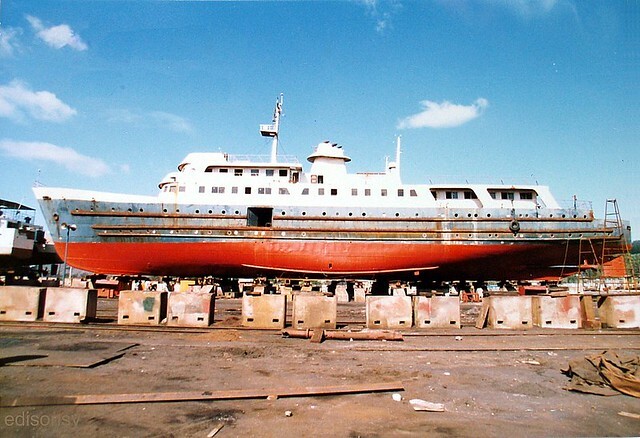 There were no more brand-new ships after the Cebu City of William Lines came out in 1972. If the mid-1960’s was marked by acquisition of second-hand passenger-cargo ships (most were not really liners) from Europe, in the 1970’s the shipping companies were looking for right direction. 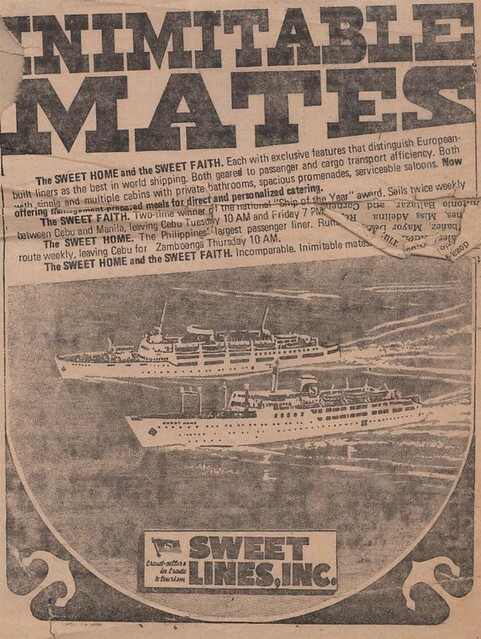 Inadvertently, Sweet Lines showed the way with the acquisition of the Sweet Faith in 1970 and the Sweet Home in 1973. This started the era of fast cruiser liners in our seas. However, due to the fogs of uncertainty in the economic climate, few realized this was the new paradigm, the fast cruiser liners. Among the liner companies, only William Lines took up the challenge early with the Cebu City. 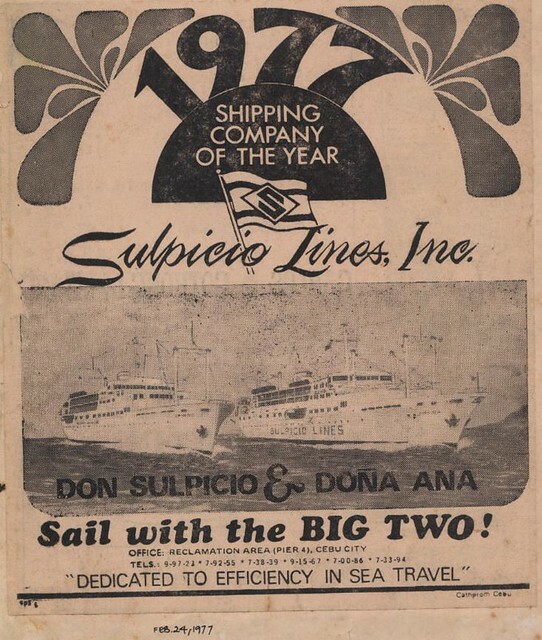 In the middle of the 1970’s, Sulpicio Lines followed suit and acquired fast cruiser liners beginning with the Don Sulpicio and Dona Ana. William Lines also kept in step by successively acquiring fast cruiser liners which were named after cities, the Manila City, Cagayan de Oro City, Ozamis City, etc. What happened then to the other liner companies especially the other top guns? In the decade of the 1970’s, Compania Maritima was already in its death spiral but few realized it then because they were held in such high regard because they have been No. 1 for so long. Actually, there might have a death wish in them already. Compania Maritima never bought another liner after the second-hand but big Luzon in 1970 until their demise in 1984. At the same time, their ships were sinking with alarming regularity and mostly by wrecking. Meanwhile, Aboitiz Shipping Corporation became heir to the PSNC (Philippines Steam and Navigation Company) fleet and operations. The Laurel-Langley Treaty dictated that in 1974 the Americans no longer have the right to do business here as if they are Philippine nationals (they have a right previously because of the Parity Amendment to the Philippine Constitution). But after 1974, Aboitiz Shipping Corporation did not buy a liner anymore and just relied mainly on a few small liners plus the trio of liners ordered by Everett Steamship in Japan in 1955 and the former “FS” ships they already had and the once from PSNC. These ships were already showing signs of mortality as they were already entering their fourth decade of service. Sweet Lines, after acquiring liners that were among the biggest and the best for a decade which pulled them up in the totem pole of liners had the puzzling decision to just buy small liners in the later 1970’s. This happened in a situation when their liners from Europe were already over two decades old. In those times due to weaker metallurgy and finishing, 30 years is almost the longest service that can be expected from liners built in the 1950’s and so this means Sweet Lines has a future problem in the 1980’s. Did Sweet Lines think the 1980’s will be better? The combined Carlos A. Gothong Lines Inc. (CAGLI) and Lorenzo Shipping Corporation, successor companies to the broken-up Carlos A. Go Thong & Co. also had the same policy decision as Sweet Lines, that is to just buy small liners (many can even be just classified as passenger-cargo ships). 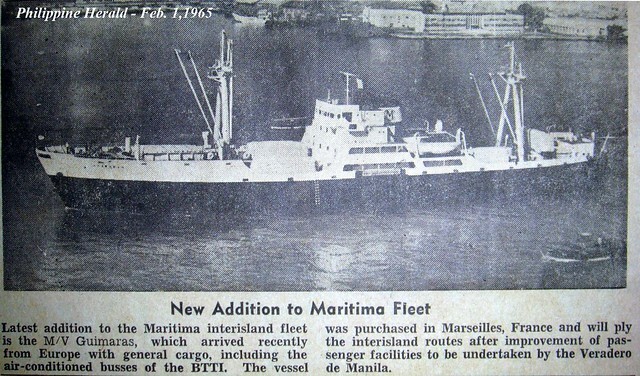 Meanwhile, the old Escano Lines also stopped buying ships in 1974 like Aboitiz when they acquired the small Katipunan. All in all, from 1973, only Sulpicio Lines and William Lines acquired big, fast cruiser liners. Compania Maritima, Aboitiz Shipping Corporation, Sweet Lines, Carlos A. Gothong Lines, Lorenzo Shipping Corporation all stopped buying big liners especially the fast cruiser liners (and that type is beyond the means of minor liner shipping companies including Madrigal Shipping). Maybe one reason is the steep cost already of liners because of devaluation, maybe it was the general economic difficulties which produce conservatism in businessmen, maybe it was also procrastination and hoping the next decade will be better. And so it was not a surprise that in the 1980’s, from a rough equality of the top companies after the break-up of Carlos A. 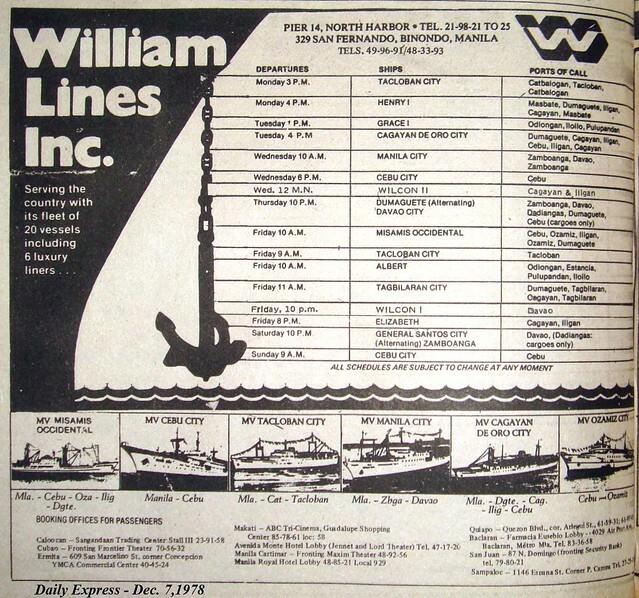 Go Thong & Co. in 1972, the liner scene was dominated by Sulpicio Lines and William Lines because they were the only ones which bet on the new ruling paradigm, the fast cruiser liners. The other simply lost their way or maybe even their enthusiasm and were just waiting for better days. I must admire not the depth of the pockets of the two but the Japanese agents which bet and trusted Sulpicio Lines and William Lines. I think that was the critical factor why the two kept getting fast cruiser liners even though the economic climate was not good over-all. Sulpicio Lines continuously acquired retired cruisers from RKK Lines and William Lines from Arimura Sangyo (the later “A” Line). Incidentally, both are Okinawa shipping lines. So their fast cruiser liners competed in Japan and they continued their rivalry here. The next decade, the 1980’s, was even more difficult and it resulted in the death of so many liner companies, both major and minor. A new leading paradigm will emerge then, the RORO liners. Some majors will awaken from their stupor and try to compete again. Among them were Aboitiz Shipping Corporation and Carlos A. Gothong Lines Inc. Negros Navigation will also be among them after they also slowed down in buying cruisers (they were not in danger then because their cruisers liners were new and they had a monopoly of Bacolod port). And that is how the chips broke in the 1970’s. Another time of trouble will happen three decades later but then that is another story worth another article.